When asked about how she’s been able to keep her skin so radiant and young, Catherine Zeta-Jones praises the benefits of Moroccan argan oil. She says with all the time she spends on planes and in dry hotel rooms, she needs something to hydrate and revitalize her skin, and a few drops of argan oil before bed and throughout the day does the trick. Argan oil has moisturizing capabilities, can provide strength and shine to hair, reduce the visibility of stretch marks, and offers a number of other assets to skin care. Argan oil benefits for skin also include a reduction of the effects of premature aging. adding a revitalizing fullness and smoothness; it can even help reduce acne. Argan oil comes from the nuts of argan trees, which are native to Morocco. Kernels are extracted and pressed to make the oil, which has been used in Morocco to treat skin conditions and as cosmetic oil for skin and hair. It’s rich in vitamin E, vitamin A, fatty acids (like omega-6 and linoleic acid) and antioxidants. Research on argan oil is pretty promising, and there’s far more out there to support its benefits than Catherine Zeta-Jones’s praise. What makes argan oil so unique is how its array of ingredients (vitamins, minerals, antioxidants, and fatty acids) work together to offer benefits that no one ingredient can provide on its own—whether you choose to rub it on your skin, apply to your hair, or even eat it! Of course, to get the maximum benefit you’ll want to get pure argan oil. Studies show argan oil helps maintain skin color by helping to create melanin, while targeting inflammation and helping to improve healthy cell turnover. It may also help inhibit cells that lead to melanoma. Its components have been proven to promote elasticity and hydration, and strengthen and repair skin and hair, making it a true benefit to anyone looking to add some shine and maximize their appearance. 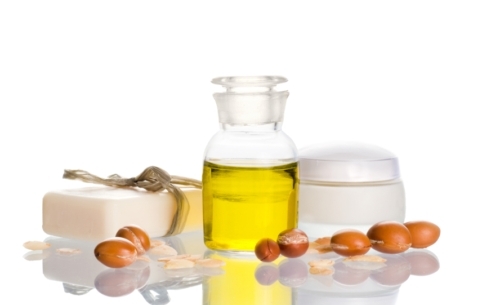 Argan oil can be used as cosmetic beauty product, as well as one to help treat various skin conditions. Argan oil is pretty impressive stuff and it has a number of health benefits. It can be a valuable asset for anyone looking for an anti-aging serum or to remove scarring, treat acne, or simply get a little more out of their skin. And because it’s a natural product, you won’t have a hard time reading the ingredients label! Argan Oil for Acne: Although it’s often thought of as a teenage skin condition, acne can strike anyone. In fact, it can sneak up on people in middle age or even later in life with seemingly no explanation. Argan oil can be applied to skin surfaces affected by acne to help balance and promote its natural moisture, as well as soothe the skin, repair damaged skin cells, and balance sebum levels. To experience argan oil benefits for acne, try applying a few drops to your face after washing and patting it dry. Warm the oil in your hands, and then rub it in gently over the affected area twice per day to see improvements. Anti-Aging: When Zeta-Jones shows up for an event, her young-looking skin—that doesn’t seem to match the numbers on her driver’s license—strikes people. Argan oil can help keep skin looking young by reducing the visibility of wrinkles. It can restore elasticity to fill in wrinkles and it also provides more give the skin so it can stretch. The antioxidants and fatty acids also help rejuvenate damaged skin cells. In order to get the most from the anti-aging benefits of argan oil, gently massage it into your face and head before bed—that’s what Zeta-Jones does! Skin Moisturizer: One of the most beneficial aspects of argan oil is that it’s not greasy when you apply it—something that can’t be said for most other moisturizers. Vitamin E, along with its fatty acids, help to soften skin and keep it hydrated, even if you live in a dry area. It works in the deserts of Morocco, dry airplanes, cold winter climates, and just about any other environment that can strip moisture from the skin. To take advantage of this valuable benefit of argan oil, put a few drops on your skin (wherever it’s needed) and gently rub it in. Hair Conditioner: The benefits of argan oil go further than skin care; it’s also got benefits for your hair. It’s become a popular product for people looking to add a little softness, strength and shine to their hair. Once again, the unique blend of fatty acids and antioxidants working synergistically provides multiple benefits for hair; much like it does for skin. What makes it even better is that because it’s not greasy, you can apply it to dry hair to experience its benefits. One thing to note: if you plan to use it overnight, wear a shower cap. This will trap the heat from your head, allowing the oil to more easily penetrate your hair, and you won’t get oil on your pillowcase! Stretch Marks: Argan oil skin benefits also include applications for stretch marks. Whether you’ve got stretch marks around your waist, shoulders or chest, rubbing argan oil on these areas can help make them less visible. Vitamin E along with the other nutrients in argan oil can make it effective to improve skin elasticity and reduce the appearance of stretch marks over time. Combine a few drops with brown sugar and apply a couple of times per day by rubbing it in gently. Remember to not overuse it, but rather stick to a routine—the benefits on stretch marks will not come overnight, so be patient. Pure argan oil can provide all kinds of benefits for your skin health. As with most natural treatments, it’s best when applied and used in its natural state, so set your sights there. Be sure to use 100% pure argan oil that’s been cold-pressed. Manufactured products featuring it as an additive—or featuring other additives—may not exhibit the results you’re hoping for. And one more thing to consider—it’s very expensive. Thankfully, you don’t need a lot of it; in most cases, a few drops is all you need! Villareal, M., et al, “Activation of MITF by Argan Oil Leads to the Inhibition of the Tyrosinase and Dopachrome Tautromerase Expressions in B16 Murine Melanoma Cells,” Evidence-Based Complementary and Alternative Medicine, July 2013, doi: 10.1155/2013/340107.